Today the CollabLab team had the opportunity to present a webinar to the Illinois Principals Association / Ed Leaders Network: The Collab Lab at Elk Grove High School: Responsive and Sustained Teacher-Led Professional Learning. Our purpose was to share with the participants how they can support sustained and responsive teacher-led professional learning in their buildings. We did this by sharing how we started in peer observation groups and how we continue to evolve in the CollabLab today, centering our conversation around our motto of "Connect, Learn, Share." Alongside us, our principal, Paul Kelly, supported us and collaborated with us on this presentation. His focus was to help participants reflect upon professional learning in their own building and help guide them in creating possible action plans. You can access a copy of this document here. Throughout the webinar we connected with participants through the hashtag #elnpln. Check out our conversations and connect with others. You can access our PowerPoint here. 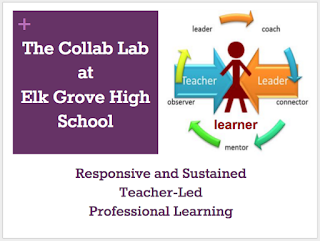 It contains links to all of the resources supported by the CollabLab. Please let us know if you'd like to share your ideas or talk to us about professional learning in your school or ours!